When people died during the reign of Queen Victoria the corpse usually stayed in the home until the burial. The body was surrounded by family and friends where viewing and touching the deceased were commonplace. Even children were not spared from viewing the dead, and in poor homes they may have had to share a room or even a bed with a dying sibling. There were rules of etiquette written about funerals regarding the planning, flowers, services and mourning of a loved one. Some of these rules were probably less strict in rural areas. 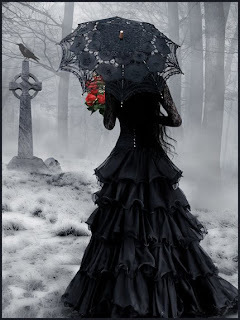 Etiquette dictated certain lengths and stages of mourning as well as colors and fabrics. Each family member, or servant living with the family went through a period of mourning. Women were expected to mourn for two years. They adopted a wardrobe of black crape without lace or decorations. No ornaments were worn, except jet, for the first year. To appear fashionable during times of mourning women of lower class would dye their clothing black. Gentlemen wore black cheviot suits with broad crape bands on their hats, and black gloves. Children also wore black, and babies were dressed in white garments trimmed with black ribbons. Postmortem photography of the deceased often served as mementos of families who could not afford a painted portrait. Having a photo of the deceased, especially of children, was particularly important when no other photos already existed. The invention of the Carte de Visite, which enabled multiple prints to be made from a single negative, meant that images could be sent to distant relatives, or used on memorial cards announcing the child’s death. The deceased were commonly represented as though they were peacefully sleeping rather than dead, although at other times the body was posed to look alive. Mourning jewelry such as lockets, brooches and rings, usually containing a lock of hair and/or photograph, functioned as tangible reminders of the deceased. 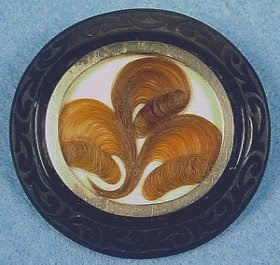 While not exclusively for mourning, hair art was a natural way to remember a deceased loved one. “Hair is at once the most delicate and lasting of our materials, and survives us, like love.” –Godey’s Lady’s Book, May 1855. Godey’s Lady’s Book and Peterson’s Magazine introduced the craft of making mourning jewelry, which soon became a popular pastime. Preparation was important. First the hair was boiled in soda water for 15 minutes. It was then sorted into lengths and divided into strands of 20-30 hairs. Most pieces of jewelry required long hair. For example, a full size bracelet called for hair 20 to 24" long. Sometimes horse hair was used because it was coarser than human hair, and thus easier for a beginner. Godey's reminded readers that while mourning etiquette dictated only jet jewelry as being allowed during the first stage of mourning, during the second stage of mourning one could wear a brooch or bracelet made of hair detailed with a gold and black enamel clasp. Even a watch chain or plain gold belt buckle was permissible for widowers to wear if it was made of hair, or if it enclosed hair. The fashion for all mourning jewelry came to an end at the turn of the 20th century with the death of Queen Victoria. It reminds me an urban history that my grandfather used to tell as about a women that walked at night and she cried everyday because she was lost her son. Can ayone tell me who the artist is that did the first picture in this post? The mourning woman picture. I really want a poster of this, if such a thing exists. very nice description of the Victorian rituals. The purpose of this blog is to supplement Victorian Rituals by providing additional information that I couldn't find a place for on the website. I also wanted to allow visitors the opportunity to participate by sharing their comments. Enjoy and thanks for visiting!